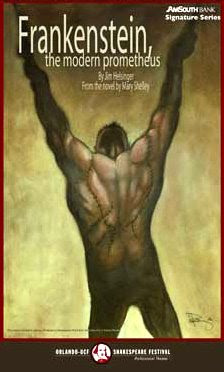 Barely five years after it was first published, Mary Shelley’s Frankenstein was adapted to the stage. The 1823 production, which Mary attended, was so successful that it inspired a slew of knockoffs, including lowbrow pantomime and parody, and revived interest in Mary Shelley’s book. In fact, a second edition of the book was rushed out to capitalize on its sudden theatrical popularity. Since then, the book has not only remained in print, it has continued to be an inspiration for creators in the theater and all manner of media. For playwrights, the powerful themes suggest endless avenues of exploration, and the operatic scale of the story creates unique dramatic and visual opportunities. For actors, the roles of the obsessed, doomed Frankenstein and his wretched, cobbled Monster are simply irresistible. One of the most intriguing and unarguably challenging adaptation of the book in recent times was Jim Helsinger’s script designed for one actor to portray all the parts, six different characters, in the Orlando Shakespeare Theater’s Frankenstein: A Modern Prometheus. The first production, in the fall of 1998, featured actor Eric Hissom (pictured at left). The play was reprised in 2006 with Steven Patterson (across the top as Walton, Frankenstein, and The Monster). The one-man show called for the actor to play an amazing range of characters, with different personalities and individual body language. The parts in this version include that of an arctic explorer, Walton; Frankenstein’s friend Henry Clerval; the science teacher, Doctor Krempe; the compulsive Frankenstein as both an energetic youth and a broken, older man; and, of course, the powerful but childlike Monster. One of the necessary tricks employed here was to give each character his own accent. Frankenstein speaks with a Germanic lilt, Clerval is French, and the explorer Walton, British in the original novel, is played as a Yankee captain. Though there was only one man onstage, an indispensable crew of technicians provided dramatic lighting and sound design, and dynamic sets that allowed Walton’s ship to crash convincingly through an ice field and eventually morph into Frankenstein’s eerie laboratory. The Orlando Shakespeare Theater’s archive site (links below) features numerous photographs, and a collection of glowing reviews that provide additional and fascinating information. The one-man Frankenstein sounds like a wonderful idea and a terrific challenge, and by all accounts, the high quality of the production was as admirable as the tour-de-force performance of the principal. An interesting note: The company also produced a one-man Dracula, written and originally performed by Jim Helsinger in 1996, revived in 2003, and an adaptation of H.G.Well’s Frankensteinian The Island of Dr. Moreau, by Eric Hissom. The Orlando Shakespeare Theater’s current website. On the Company’s archival site: The Hissom Frankenstein production of 1998, and the Patterson production of 2006, with numerous photos and reviews. Steven Patterson’s web page, with more information. A video slideshow of the 2006 production. A Frankenstein Study Guide produced in conjunction with the play.